because our staff gets a boost from your energy, skills, and fresh outlook. because our dogs can’t wait to meet you (or see you again!). because our clients appreciate your efforts to help them become more independent. because volunteering increases your skills, offers meaningful connections to people in your community, and just feels good (research even says so!). Every pup in training with Eyes Ears Nose and Paws starts out in a Young Puppy Trainer home until they are placed in advanced training in our prison training partnership. It’s probably the most rigorous and fulfilling volunteer job we have. Young Puppy Trainers have weekly training assignments, which include housebreaking, crate training, and off-leash walks. Think you’d like to become a Young Puppy Trainer? Read more on the Young Puppy Trainer page to learn more about our program and the responsibilities. 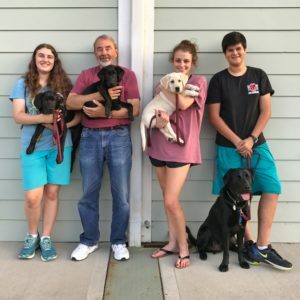 Sometimes we have a need for short-term homes for our puppies and dogs — a weekend when the Young Puppy Trainer goes out of town and cannot take their pup, for example. 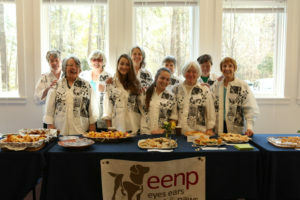 Being a Puppy Caregiver for an EENP is perfect for someone who would like to act as a puppy raiser but isn’t able to make the time commitment to be a Young Puppy Trainer. Puppy Caregivers house pups for short times during transition periods between training programs, when pups come out of our Prison Program for medical care, and in cases of emergency. From sewing patches on service capes to building puppy-height light switches, these jobs are for volunteers who like to see projects get done. Often we have projects that need willing hands — everything from stuffing envelopes to getting project materials in order. If you want to be set loose on a project-of-the-moment, this is the volunteer opportunity for you! Be a part of the final placement of our assistance dogs!!! Support our clients during their intensive training or come help out with the celebration during graduation ceremonies. We suggest starting with Volunteer Orientation, which gives an overview of EENP and our volunteer opportunities. Whether you take Volunteer Orientation or not, there are many volunteer opportunities available to you right now! Take a look at the available opportunities and sign up for them at our online listing. If you have questions or a special skill or interest, just give us a call or send us an email. We’d love to talk to you about the possibilities!